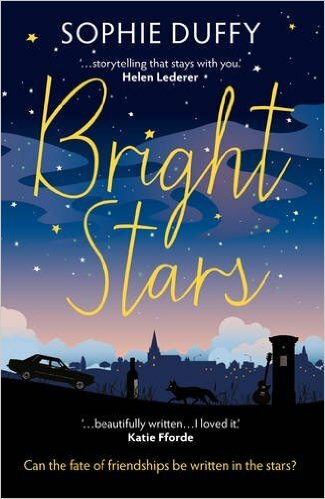 Bright Stars is about four people who became friends at university and their lives become intertwined one fateful evening in 1986. The story is narrated by Cameron Sparks in the form of his journal; it takes place in the present day, and during his time at university 25 years earlier. Cameron Sparks is 46 years old and his life is spiralling out of control. He has been suspended from his job as a Ghost Tour guide in the underground vaults in Edinburgh. He is separated from his wife and is living back at home with his dad. Then one day a letter arrives out of the blue from Christie, a Canadian girl he knew during his university days. This takes the story back to 1986 when Cameron was an awkward, cripplingly shy teenager trying to find his way at university. He finds a friend in Christie, and then by chance also becomes friends with wannabe rock star, Tommy, and he falls head over heels in unrequited love with Bex, a feminist activist. The unlikely foursome spend their time getting drunk, listening to or making music and attempting to be activists. Then one fateful night an accident happens and it changes everything. None of the characters in this book are particularly likeable, they all have such flaws but it makes the novel so very readable. Tommo always seems to land on his feet, trouble finds him but he manages to shake it off over and over again. Bex is very focused on her causes, like being a sab, and then when she and Tommo get together her life becomes about him. Cameron is not a bad person, he’s just easily led because he so badly wants to feel like part of the crowd but it’s often hard to like him in the early part of the novel because he appears so feeble. Christie is probably the nicest of the group but is the one we seemed to get to know the least as Cameron wasn’t as fixated on her as he was on Tommo and Bex. No one won on the fateful night when everything changed in the lives of these four but some of them lost more than others. This novel has such a depth to it, and has been going round and round in my head since I finished reading it. I’m finding it hard to review because there is so much I want to say but I don’t want to spoil it for anyone. This novel is really about the fine line between good and bad. About how everyone has to take responsibility for the things they do and if they don’t it will catch up with them in some form or another. There are some people who take, or are given, more than their share of blame and heartache and still spend a large part of their lives trying to come to terms with that, and perhaps punishing others rather than the ones they know who should be punished. It is ultimately a novel about how the ghosts of the past are doomed to haunt us, about how redemption never comes in the way we expect it and how karma doesn’t run an exact course. I rated this book 9 out of 10 and highly recommend this novel. This entry was posted in Books, ebooks, Read 2015, Review and tagged Book Review, Books, ebooks, Fiction, General Fiction, Read 2015, Review, Sophie Duffy. Bookmark the permalink.